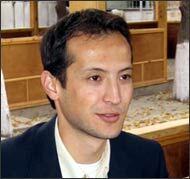 Two years ago on October 24, 2007 Alisher Saipov, the independent journalist and the publisher of Siesat (Politics) newspaper, was shot in the city of Osh in southern Kyrgyzstan. He was shot by a killer while waiting for taxi. The impertinent murder shocked not only small republic but also produced international protest. During his short professional life the son from simple family worked for several international news agencies. Two years later one can state that investigation of big crime made no progress while the real motives of the murder will be hardly ever announced to the public. Officially, the investigation of Alisher Saipov’s murder is over: the pistol is found, the investigation procedures are concluded while suspect is in the court. This was announced by Kyrgyz Interior Minister Moldomusa Kongantiev at the meeting with President Kurmanbek Bakiev on August 6. President took personal control over Saipov’s case. This means that Bakiev has all reasons not to think about scandalous murder of young journalist any more. Probably, Kyrgyz leader is not interested in the fact that additional investigation was demanded immediately after the beginning of legal process. There are too many discrepancies. Abdufarid Rasulov, the criminal defender, was arrested in February of 2009 while he was attempting to transport drugs. The authorities reported that he had the pistol from which, allegedly, Alisher Saipov was shot. In the court Mr. Rasulov denied the charge and said that investigators tortured him. He also mentioned that he was ready to prove his alibi for the day of Alisher’s murder. The report says that Abdufarid Rasulov was identified by Ikbol Mirsaitov, the only witness that accompanied Alisher at the moment of murder. There is also another circumstance that produces doubt in relation to the investigation results. Earlier, there was a version that the murder weapon had been identified in one of the Bishkek night clubs. Allegedly, it belonged to Bekkul Djekshenkulov, the son of Alikbek Djekshenkulov, the opposition leader. One can have the impression that the authorities were trying to make the opposition responsible for the murder of Alisher Saipov. Besides, another suspicious thing is that the investigators were unwilling to consider the fact that Alisher could be killed due to his professional activity. They also totally ignored the version that Saipov could be have been murdered by Uzbek special services. The point is that Saipov was a publisher of Uzbek-language newspaper that was popular not only among ethnic Uzbeks in southern Kyrgyzstan, but also in Uzbekistan itself. Observing the fact the Uzbekistan separates itself out from Kyrgyzstan not only by barbwire, but also antitank ditches one may think that Tashkent views Kyrgyzstan as a source of liberal information, dangerous for the regime of Karimov. Obviously, the official investigators made formal efforts to close the case as soon as possible and put it through the court, not worrying about true motives and clients. Even if the murder was committed by today’s suspect it is very important to find out who ordered it and why these people needed to necessarily kill Saipov, not even trying to make a deal with him (in case the journalist possessed important information). Why did the killer murder the journalist in the street that could be crowded by people? Why did the killer shot Saipov and ignored his fellow who identified him later on? The first reaction of Kyrgyz authorities means a lot. Six days following the murder Internal Affairs Ministry issues a press-release, indicating that Alisher Saipov was the person of international importance who has the links with organized extremist groups. The arguments were based on the fact that information about prohibited religious movements was found in the personal computer of Saipov. That is the point: Saipov lived and worked in the Ferghana valley, the center for religious "extremist" parties. The statement of other journalists, indicating that many correspondents of news agencies have the same samples, was ignored by officials. The first illogical official reaction, full of grammatical mistakes, made it clear that the crime will be never detected. Or it will be formally detected without finding real killers. Neither Bakiev nor Kongantiev are bothered by the fact that the relatives of Alisher Saipov still have no clear answer: what is going on with the case, sent to additional investigation on August 29. The point is that those, who closely monitored the process, are confused now as if the law enforcement bodies were trying to do that on purpose. We know that Alisher never had top secret information he had to be killed for. Alisher was that independent soldier of practical journalism that put direct questions and expected direct answers. Alisher was very bad example. Many fellow journalists followed him. Alisher was not an indifferent person. Unlike many of us, he could not just express his indignation: he always took his camera, notebook and covered issues, avoided by even experienced journalists. Trust us: no editor will dare send his correspondent to investigate the problems that can create physical threat to the journalist. Alisher, the editor of popular newspaper, never wanted to create such threats for his team. Therefore, he did everything himself. The murder of Saipov turned out to be the real breathtaking effect for Kyrgyz journalists. It produced indignation, pain and fear. The murder sent a message that the same can happen to every other curious and energetic journalist. In the previous years the Kyrgyz society could create problems for any government that ignores such violent act. This time it let it "easily" go through. Later on, it was barely reacting on the case when Syrgak Abdyldaev, the political observer of Reporter-Bishkek, was assaulted. The public opinion made no big comment when other journalists left the country. We were forced to be satisfied by the fact that some journalists managed to escape home without physical injuries! Now imagine the journalist reaction in other Central Asian states who viewed Kyrgyzstan as an island of freedom: the lesson for Alisher Saipov’s case was addressed not only to the journalist in Kyrgyzstan, but also the region in general. These past two years were painful and grievous for the friends of Alisher. It was hard to monitor the investigation process. It was annoying to see that foreign countries valued the talent and braveness of Kyrgyz journalist more than the country, where he lived and worked. Perhaps, our countries, populated by "post-Soviet" people do not need such individuals as Alisher Saipov? May be he sacrificed his life in the name of nothing? Alisher was aware about the risks, but he believed in us, our aspiration to be free. We want to believe his death is not useless. Islam (as well as other religions) recommends people visiting the graves. Each time being in the graveyard, the individual admits that nobody can avoid the death. It seems like Alisher knew that very well and realized his "temporary visit" to this world. Perhaps, this is the reason why he was so brave and fair.